Stayed up till midnight working on emails and a new bloggie project (the one I’ve been procrastinating on for like a year now). Coffee was a necessity today. 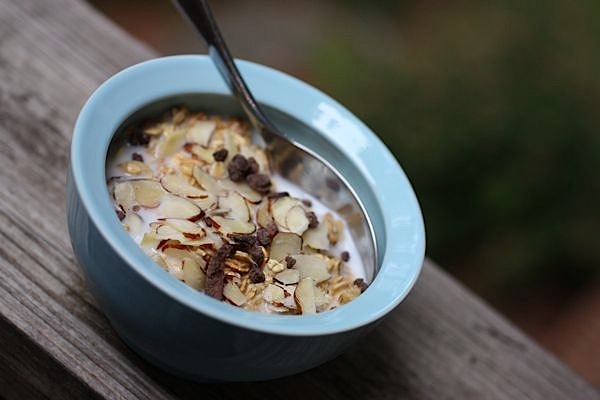 Since I was feeling so lazy, a no-cook breakfast was in order. 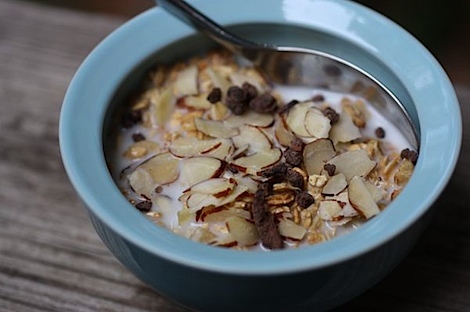 I just put some Galaxy Granola in Not Sweet Vanilla in a bowl with some organic milk, sliced almonds and cacao nibs. Mate Vana is helping me wake up today, too. Anywho, you’re probably wondering about the title of this post. It’s true, Cafe Don Pablo has offered to give away a 2lb bag of coffee to one lucky reader! 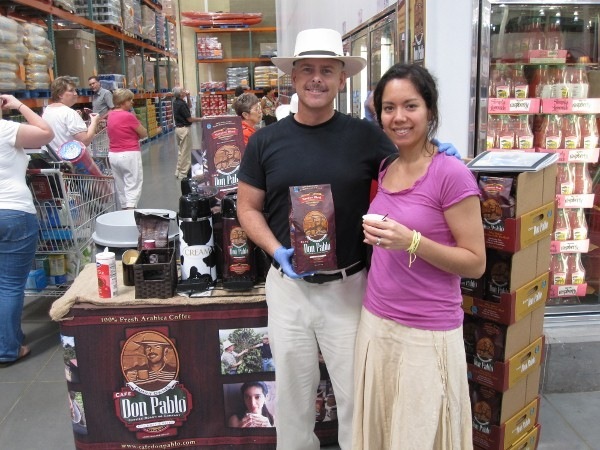 You may remember I met the people behind Cafe Don Pablo when they were sampling their coffee at Costco this past weekend. 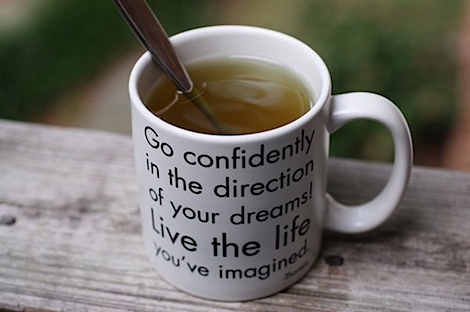 Hubby and I picked up a bag of the coffee (we bought it FTC) and have been enjoying it with breakfast this week. Anywho, while I was at Costco, Darron, founder of Burke Brands LLC offered to do a giveaway for The Chic Life readers. Score! Sweetly intense, balanced aroma, with milk chocolate, cedar and ripe tomato notes. In the cup the acidity is sweet and well-integrated, the body full and mouthfeel supple, and the flavor quite sweet, with chastened but still rich complication: semi-sweet chocolate, ripe tomato, and a round, low-acid fruit that suggested banana. The finish is cocoa-toned and slightly though warmly astringent. We have relationships at the oint of origin that give us a dedicated source of supply of the finest Arabica beans available. We grow, pick, and process our own coffee beans in Colombia. We never blend our coffees with Robusta, past crop, or defective beans. We roast to order in regional small batch roasting facilities in the U.S. We never roast overseas, on a production schedule, or allow distributors to warehouse our coffee. We also do not require large minimum orders from our customers, guaranteeing that you get the freshest coffee possible. You can smell the difference! I also like that they are Sharing Certified (click to learn more). Ready to win some yummy coffee? *mandatory* Leave a comment on this post and say which of the 4 Sharing Certified areas resonates with you most (hint: here’s where they are located online: http://www.cafedonpablo.com/sharing_certified.html ). Tweet @thechiclife how you take your coffee (with cream, black, etc) with a link to this post (http://bit.ly/cBFQzR), for example: “@thechiclife I love my coffee with milk and sugar http://bit.ly/cBFQzR ” (remember to include the URL!) Leave a separate comment on this post to let me know that you tweeted an entry. Subscribe to The Chic Life blog feed (https://thechiclife.com/wp-rss2.php). Leave a separate comment telling me you did. Add The Chic Life to your blogroll. Leave a separate comment telling me you did. Link to this contest from your blog. Leave a separate comment telling me you did. Each entry must be left as a separate comment on this post to count individually. All entries must be received by 8pm ET next Wednesday, August 18th, 2010 (you have one week to enter!). Shipping is for US only. Winner will be notified via email and so must have a valid email address. If winner doesn’t reply within 48 hours of email notification, a new winner will be selected. And special thanks to Cafe Don Pablo for having this giveaway! 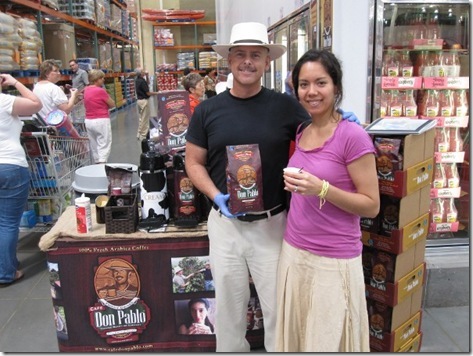 And PS If you don’t win, you can find Cafe Don Pablo’s signature blend at Costco! woohoo! I’m the first to enter! Do I get an extra entry for that? 😉 The Labor standards resonated with me; It hink it’s great they are using coffee to improve lives and working conditions for the growers. Oh, it’s hard to pick just one! I’d definitely say the most important for me is labor conditions. Improving the lives of the locals is bound to have a positive effect on everything else. I love ALL 4 parts of their 4 sharing certified areas, but since a lot of other coffee companies bring up the labor & sustanable ag, I like how they also bring up the environment. I agree with the fair labor conditions. That is so important! I really like all four, but I love that they recognize the environment as one of their key areas! And I am subscribed to your RSS! They are all extremely important, but I think that labor stands out as #1 to me. Improving the lives of the local people will not only help them, but surely cause a snowball effect and lead to a plethora of positive improvements! Looks like a great giveaway! I would say the labor stood out to me the most both they are all good. I like there website. Great information on there. I already follow you as well! hmmm tough choice, but I think labor conditions. Thanks for hosting! i would say labor conditions. 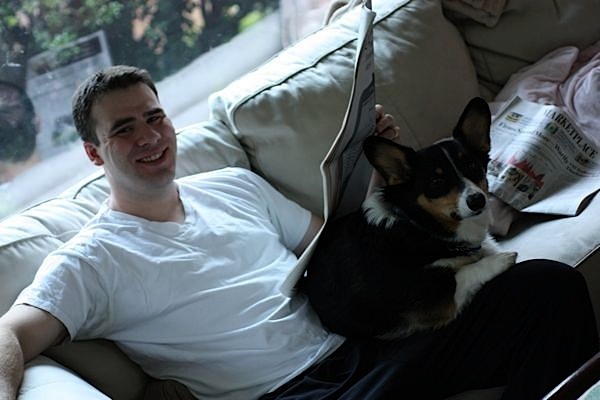 A few years back, I made a trip to Guatemala and saw the unfair conditions for myself. It is incredible to personally witness a group of people work so hard yet get completely undermined. If we can only work towards more fair trade for these hard working, passionate, loving people, the world would be a better place. Picking one is hard! I’m torn between Labor and Environment – both are so important! I really think the labor aspect and environmental impacts are the most important! We are all connected to the earth and the ethical treatment of workers is vital! Labor was best to me because it makes people’s lives better in many ways…and they deserve it! 🙂 Wish me luck! You are on my blogroll! I read just about every day! I am a subscriber…wish me luck! I love, love coffee and care about good quality, but protecting our environment is what I care about the most. Thanks for the giveaway! I have a coffee obsession so this is extra fun! I think the biggest reason I like ethically grown coffee is what it does for the community (so I guess I’d answer labor). sustainable agriculture all the way! I’d say the labor aspect is most important. But, really, they all resonate pretty strongly with me. Really strongly. That’s so awesome. I am subscribed to your feed! I tweeted, and then I subscribed to your blog! Hey maybe I’m being blonde here but I think something is wrong with your RSS the feed is like looking really weird! To me, the labor aspect of Sharing Certified is the most important. I feel strongly that people should be fairly awarded for the work that they do. Also, I love coffee and living in NYC it is so expensive! I always buy fair trade coffee though. I like the sustainable agriculture aspect – it’s very important (and SHOULD be important for farmers) to promote future viability. I know this isn’t one of the four, but I also love the idea of their “living program”… sounds like a very cool and progressive organization. I’d LOVE to try their coffee ! Living in an agricultural area has really opened up my eyes to the lives of the farmworkers here so I would say the labor standards really resonated with me. I’m glad that more and more companies seem interested in the lives of their growers. What a great giveaway! Labor resonates the most with me– its wonderful that they care so deeply about the workers! All 4 are wonderful but Labor resonates with me the most. Some of the most hard-working, kind-hearted people have the least respected/treated jobs. I love that Don Pablo is all about improving the lives of their workers. I think the labor resonates most with me. I think it is so important to have compassion for every individual, no matter their work. I think the labor section really jumped out at me – every worker in every field deserves dignity and acknowledgment for their efforts and contributions! Just subscribed to your blog feed! You’re in my google reader – is that the same thing as subscribing to your blog feed? Environment is important to me because so many food producers mistreat their surroundings. It’s nice to see a brand committed to standards over profits. Both labor standards and environment stand out to because I feel strongly about both being fair to workers and caring for the earth so that future generations will be able to enjoy it as we did, but I think I’ll go with labor standards here because caring for the environment starts with caring for the people working on it. Sustainable agriculture is really important to me. I live in an apartment, and can’t garden for myself. I like to support farmers that do mainly sustainable growing. I especially love my CSA share! 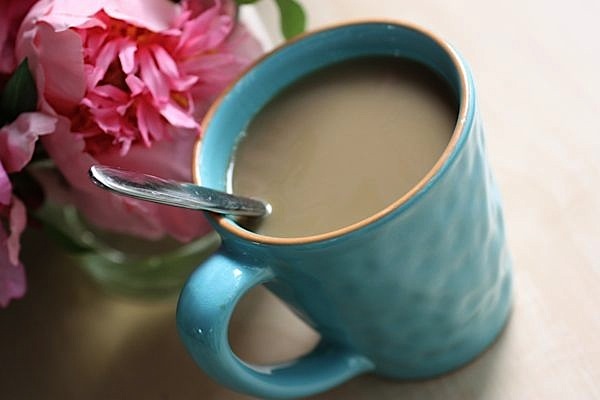 I love coffee – excellent giveaway – thanks for having it! LABOR probably resonates with me the most, in the end, it’s all about the people! Environment (more people should be concerned about the quality of the environment both short and long term).